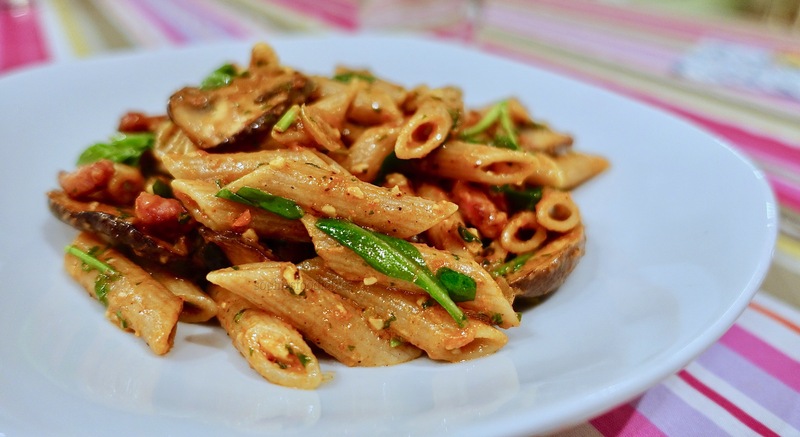 Home-made red pesto pasta dinner! the same peppered extra virgin olive oil as used above! First, make your red pesto. Take a food processor & add all ingredients in it. This is the semi-dried red tomatoes, the chopped basil, the Parmesan cheese, the roasted cashews, balsamic vinegar & 2 tablespoons of a peppery extra virgin olive oil & some sea salt, but not too much because the Parmesan cheese is already salty! Now, pulse & chop until it is the consistency of a red pesto, with bits & chunks in it. Put into a bowl & set aside. Now, cook your pasta like on your packet instructions. Drain well & keep warm. Fry onions, mushrooms & smoked bacon. Take a big pan & heat up on high. Pour some of that same peppery extra virgin olive oil in it. Add chopped onions & fry for a few minutes, stirring often. Add some butter, some more oil & sliced mushrooms, some pepper & some salt. Fry until golden & cooked through on all sides. Remove from the pan & keep warm. In the same pan, fry your smoked bacon until browned & cooked through. This will only take a few minutes. 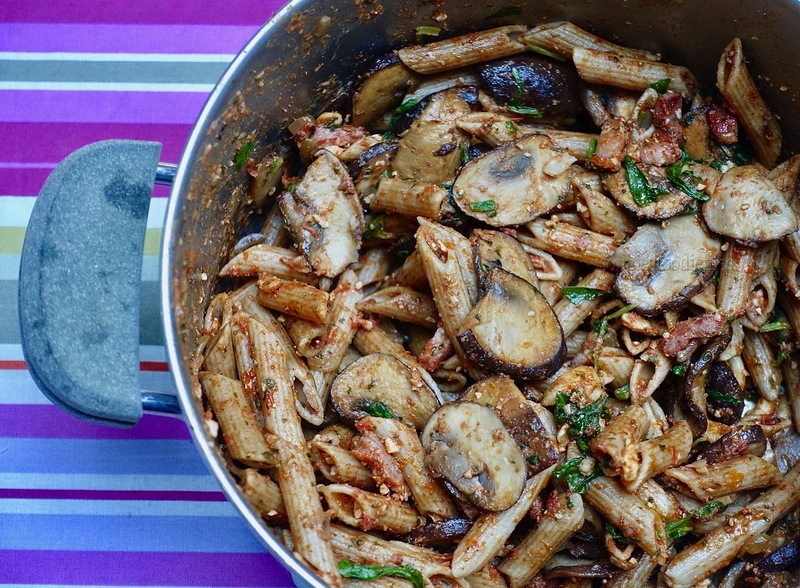 Take a few tablespoons or all of your red pesto through the hot pasta. Mix well. Add fried bacon & mushrooms-onion mix. Add a bunch of fresh rocket leaves to the hot pasta mix. Check seasoning, one last time. I added 10 grins of freshly milled black pepper & some sea salt. Mix it well. Serve at once! Enjoy, with loved one’s! 🙂 MMM! The perfect pasta com! Yes! If you loved reading this post & would like to receive cool email posts from me, just SUBSCRIBE to my lovely blog HERE!! Previous Post Vegan Fig Pear Cakes! Next Post Vegetarian Mandarin Salad with mandarin dressing!!! This looks like something we would absolutely love Sophie!! I’ve heard of sun dried tomato pesto, but have never tried to make it! Thanks for the recipe! I’m saving it. Hope you are doing well there– blustery days? Fall colors? We are just starting to get cooler weather and I’m so happy for it! hugs hugs! Thanks, my dear friend! Enjoy!